2002-06-02. New. Ships with Tracking Number! INTERNATIONAL WORLDWIDE Shipping available. Buy with confidence, excellent customer service! Random House, 1/1/1977. Hardcover. Acceptable. 1.1100 inches 9.1300 inches 6.5700 inches. Hardcover. Dust jacket has wear and tear. Pages are in good condition. Random House. Hardcover. B001MXUI8S New Book. Dust jacket in protective mylar cover has some shelf wear on the spine. . New. New York: Random House, 1965. Reprint. Hardcover. INSCRIBED by the author. Tall 8vo. 523 pp. Index in English & German. A fine copy in near fine dustjacket (minor wear to extremities). Random House. Used - Good. Good condition. Good dust jacket. New York: Random House. 1965. Hardcover. 0394401387 . Near Fine in a Near Fine dust jacket. Edge wear. Clean and bright pages. ; 9.72 X 6.30 X 2.36 inches; 523 pages; Original unclipped dust jacket protected by archival Brodart cover. All domestic orders shipped protected in a Box. .
Random House. Hardcover. 0394401387 New Condition *** Right Off the Shelf | Ships within 2 Business Days ~~~ Customer Service Is Our Top Priority! - Thank you for LOOKING :-) . New. Random House. Hardcover. 0394401387 Special order direct from the distributor . New. 2002-06-02. Good. Ships with Tracking Number! INTERNATIONAL WORLDWIDE Shipping available. May not contain Access Codes or Supplements. May be ex-library. Shipping & Handling by region. Buy with confidence, excellent customer service! Random House. Hardcover. 0394401387 1st edition 2nd printing - 1966 Random House hard cover - minor wear to dust jacket (now in mylar cover) slight stain on page edge - otherwise cover and binding fine contents clean - enjoy . Very Good. Random House. Hardcover. 0394401387 *LIKE NEW* Ships Same Day or Next! . Fine. Random House. Hardcover. 0394401387 *BRAND NEW* Ships Same Day or Next! . New. Random House. Used - Very Good. Hardcover w / dustjacket. Very good condition; edges, corners, and covers of book show minor wear. No underlining; no highlighting; no internal markings. DJ is Good; edgewear, rubbing, several small tears along top edge, very brittle, slightly stained, priceclipped. Edges yellowed with aged and slightly stained. Stored in sealed plastic protection. In the event of a problem we guarantee full refund. 1966. Hardcover w / dustjacket. Random House, 1965. Hardcover. Good. Hardcover. Sound, clean & nice copy, light edgewear. Jacket is bright & clean, light to moderate rubbing/edgewear, taped at head of spine and along the back wrap. Not price clipped. Random House. Almost Like New, Binding Are Clean And Crisp. Large Volume Book On German Cooking. Each Recipe Has Both English And German Titles, Book Is In English. . Very Good. Hardcover. 1st Printing. 1993. Random House, 1965-10-12. Hardcover. Good. Random House, New York: 1965. Hardcover with dustjacket. Good condition. Comprehensive collection of recipes from delicious soups to the greatest baking specialties of the world. Contains Indexes in both German and English. Random House, New York: 1965. Hardcover with dustjacket. Good condition. Dustjacket has slight chips and scratches. Comprehensive collection of recipes from delicious soups to the greatest baking specialties of the world. Contains Indexes in both German and English. Random House, 1993. Hardcover. NF. Ink to endp/NF.. 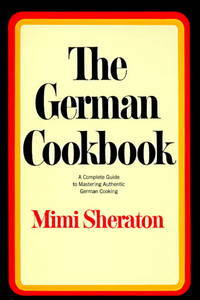 Authentic book of German cuisine, with indexes in English and German. Random House, 1965-10-12. Hardcover. Used:Good. NY: Random House. NF. 1965. Later Edition. Hardcover. Later edition quarter bound in black cloth and boards. A Near Fine cop y in a Near Fine dust jacket. There is some dust spotting to the edges of the page block. The dust jacket has mild tanning to its spine and interior flaps. Mild tanning and dust soiling to its rear panel. .
Random House. Hardcover. 0394401387 Ships promptly from Texas. . New. 1965. Random House. Used - Good. Good condition. Acceptable dust jacket. New York: Random House, 1965. 523pp. Hundreds of recipes.. BCE. Hard Cover. Very Good/DJ VG (tiny closed edge tear). Large Octavo. Random House, 1993. Hardcover. Very Good. Spotting to page edges, no other markings. 523 pages. $34.95 on the front flap of the dust jacket. Random House. Hardcover. 0394401387 In very nice condition, clean interior, the binding is tight and even. Very nice dust jacket. Close to like new. No flaws to report. . Very Good. Random House, 1965. Hardcover. Very Good. Disclaimer:A copy that has been read, but remains in excellent condition. Pages are intact and are not marred by notes or highlighting, but may contain a neat previous owner name. The spine remains undamaged. The dust jacket is missing. At ThriftBooks, our motto is: Read More, Spend Less. Random House, 1965. Hardcover. Good. Disclaimer:A copy that has been read, but remains in clean condition. All pages are intact, and the cover is intact. The spine may show signs of wear. Pages can include limited notes and highlighting, and the copy can include previous owner inscriptions. An ex-library book and may have standard library stamps and/or stickers. At ThriftBooks, our motto is: Read More, Spend Less.Dust jacket quality is not guaranteed. Random House , 1977. Hardcover. Used - Very Good/Very Good. Ninth printing, corrected 1977; minor shelfwear/scuffing/yellowing to dust jacket, covers clean and square, yellowing to book block, pages otherwise clean and square, binding tight. Random House. Used - Acceptable. Acceptable condition. Acceptable dust jacket. Dampstained. Short gifter's inscription on inside. New York, New York, U. S. A.: Random House, 1993. Hardcover. Very Good/Good +. 8vo - over 7¾" - 9¾" tall. Later Printing. Includes German And English Index. The Book Is Bound Within Boards With One Quarter Black Over Black Paper With Gilt Lettering Within A Gilt Border On The Spine. Minor Edge Wear And The Spine Tips Are Not Crisp. A Few Pages With Upper Corner Creases. The Unclipped Jacket Has Minor Wear With Wrinkling At The Edges. A Few Short Tears. New York, N. Y.: Random House, 1977 Dj has lots of edge tears, 1 1/2 inch chip missing from the dj spine. Light edge soil. Dj has very light soil. Light stains on a few pages. . 9th Printing, Corrected. Hard Cover. Good/Acceptable. 8vo - over 7¾" - 9¾" Tall, 523 Pages . Random House, 1993. Book. Very Good. Hardcover. 8vo - over 7¾ - 9¾" tall. 1993 Printing. Very-good condition hardback with a good condition jacket. Jacket is clean and bright, shows light wear (1 small, closed tear at front top corner of jacket). No writing or tears inside book. Tight spine, clean pages. 528 pages. .
Random House. Hardcover. 0394401387 . Very Good. Random House. Hardcover. 0394401387 Contents are tight and clean . Very Good. Random House, 1965. Hardcover. Acceptable. Disclaimer:A readable copy. All pages are intact, and the cover is intact. Pages can include considerable notes-in pen or highlighter-but the notes cannot obscure the text. At ThriftBooks, our motto is: Read More, Spend Less.Dust jacket quality is not guaranteed. Random House. Hardcover. 0394401387 Item in good condition. Textbooks may not include supplemental items i.e. CDs, access codes etc... . Good. Random House, 1965-10-12. Hardcover. Good. Ships Out Tomorrow! Random House, 1965-10-12. Hardcover. Acceptable. Ships Out Tomorrow!